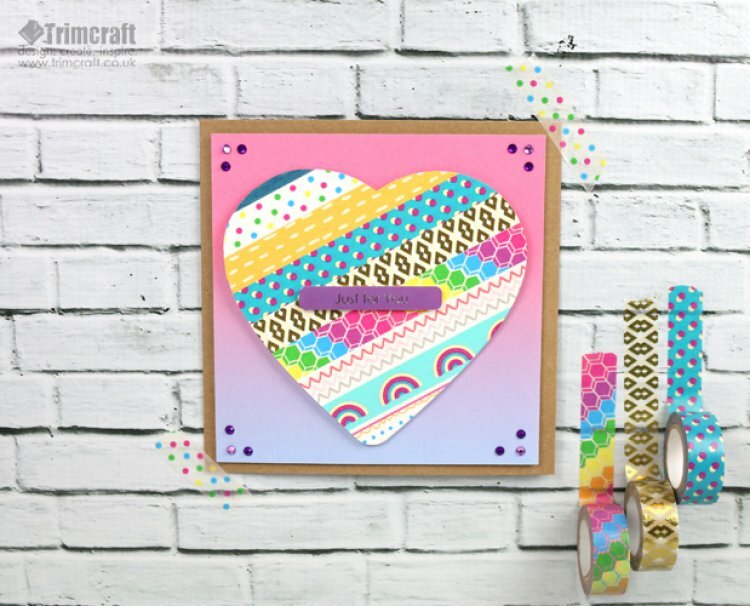 There is such a variety of Dovecraft Washi Tape to choose from and with these two templates you can craft for all sorts of fun occasions. 1. Firstly, cut a 14cmx14cm square of the ombre paper within the Simply Creative 12x12 Happy Days paper pad. Adhere this to the centre of your Dovecraft 6x6 Kraft card blank with 3D foam pads to add dimension. 2. Print the free template onto a sheet of Dovecraft white card stock. If your printer doesn’t take card, print the template onto A4 paper, cut out the heart shape and draw around it onto a sheet of card. 3. Pick a selection of Dovecraft Washi Tape for the occasion you’re crafting for, cut approximately 15cm strips and stick them diagonally across your design. Continue doing this until you have covered your design. 4. The Dovecraft Washi Tapes are slightly translucent, which will allowyou to see the template underneath your washi design. Follow the template line and cut out your heart shape. 5. Stick your washi heart to the centre of your card with 3D foam pads. 6. Add three, Simply Creative gems in each corner and add a Dovecraft Berry Blush ‘Just for You’ sentiment in the middle of your heart. We have also given you crafters a star shaped template that will be great for a variety of celebrations! For our star card, we followed the steps as shown above but have used a First Edition Pick n’ Mix sheet for our background. We also cut out a washi ‘Happy Birthday’ sentiment, adhered it to a strip of card and given each end a fish tale to add interest. We finished by decorating with a few Simply Creative gems because everyone loves a little sparkle! You could use these two washi tape templates for cards, DIY Projects, home décor and so much more! How will you use our free printable on your crafts? We’d really like to see your inspired makes so remember to upload them to the project gallery and when uploading to social media to #Trimcraft! Trimcraft design these templates to aid your crafting projects, so we are always happy to see them being used and enjoyed. However, we just ask you credit Trimcraft for the template design when you publish your crafty makes online and on social media.